Principal lecturer adult nursing at the University of Worcester Kay Norman reviews Leadership and Change for the Health Professional. Ensuring effective leadership in nursing remains high on the political, professional and educational agenda, for both nursing students and those assigned to leadership and management positions. As integrated care is embedded throughout healthcare services, leadership approaches are being scrutinised to ensure cost effectiveness of services and that there is a transforming culture to motivate change. There are many nursing leadership books available and, although this text is not solely aimed at nurses, each chapter remains relevant to current nursing practice. All chapters are written in an accessible style, each one offering different viewpoints to consider in the reader’s leadership journey. Part one of the book discusses general leadership theories and includes useful information for understanding the concept and how it applies to a healthcare context. Part two explores some of the challenges associated with leadership in healthcare and provides examples of how leaders can use various approaches in complex situations. It discusses gender, equality, motivating employees and creativity but also relates to patient outcomes. 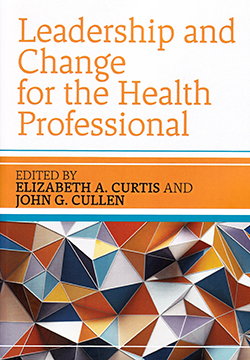 The third part of this book discusses change and implementation strategies and provides an interesting overview of current healthcare, including a global perspective. In addition to nurse educators, this text would be most useful for nursing students aspiring to become nurse leaders. It provides a useful evidence base to stimulate thinking and explore approaches to the many complex challenges we face.